Today, when you order "Fairmagic`s Impossi-Bill-Braid 3+2", you'll instantly be emailed a Penguin Magic gift certificate. You can spend it on anything you like at Penguin, just like cash. Just complete your order as normal, and within seconds you'll get an email with your gift certificate. Years ago Robert E.Neale came up with his method on how the make an Impossible gift out of a borrowed banknote using three strips and a few folds. Now it´s time to bring this idea to the next level by using five strips! 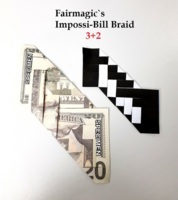 This make the Braided Bill looks more impossible then before!